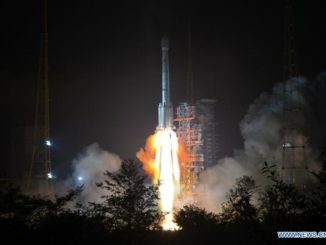 The CBERS 4 spacecraft — the fifth in a series of joint China-Brazil Earth Resources Satellites — lifted off at 0326 GMT Sunday (10:26 p.m. EST Saturday) from the Taiyuan space center in northern China’s Shanxi province, where it was 11:26 a.m. local time. 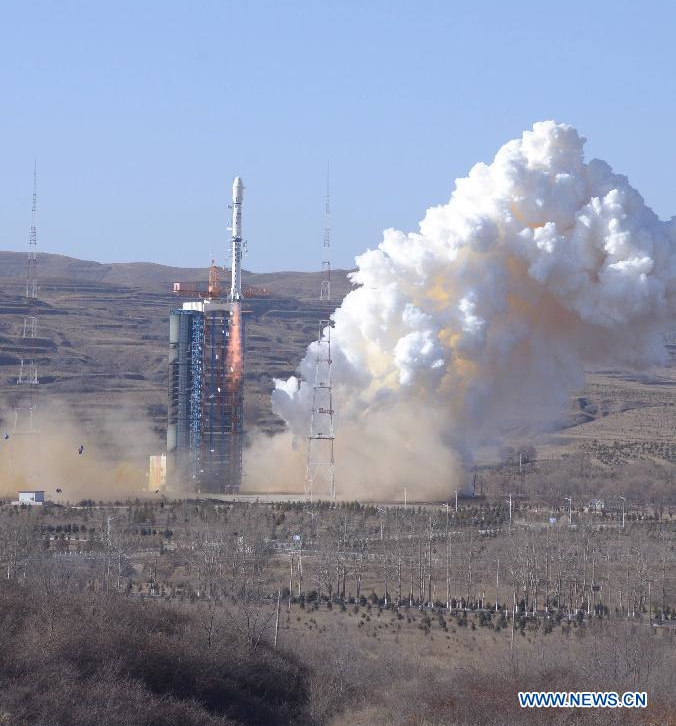 A Long March 4B rocket boosted the 2.3-ton satellite into orbit about 460 miles, or 740 kilometers, above Earth. The launcher’s third stage deployed the CBERS 4 spacecraft in orbit about 12 minutes after liftoff, according to Brazil’s National Institute for Space Research, known by the acronym INPE. The launch of CBERS 4 came almost exactly one year after an identical satellite was destroyed in a Long March 4B launch failure on Dec. 9, 2013. After the launch failure, Chinese and Brazilian officials agreed to accelerate the launch of CBERS 4, which was previously scheduled for 2015. The first CBERS satellite launched in 1999, followed by the launch of CBERS 2 and CBERS 2B in 2003 and 2007. None of the previous CBERS satellites are still operational, prompting urgency to launch a new spacecraft as soon as possible. 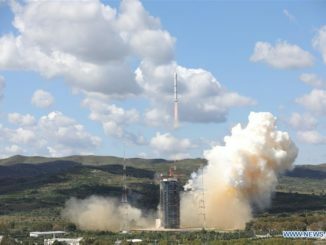 Chinese rocket engineers blamed the loss of the CBERS 3 satellite on debris that blocked the flow of fuel to one of the Long March 4B rocket’s two third stage engines. CBERS 4 carries four cameras to take pictures of Earth in visible and infrared wavelengths. Its orbit allows the satellite to observe the same location at least once every three days in low resolution, according to INPE. China and Brazil each led development of two cameras on CBERS 4. China was responsible for the $250 million mission’s spacecraft bus. 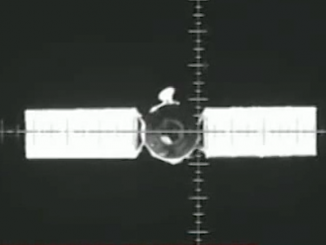 The satellite’s cameras will collect black-and-white imagery with a top resolution of about 5 meters, or about 16 feet. Its sensors included thermal and infrared imagers capable of distinguishing different types of vegetation and locations where water is stored and consumed. 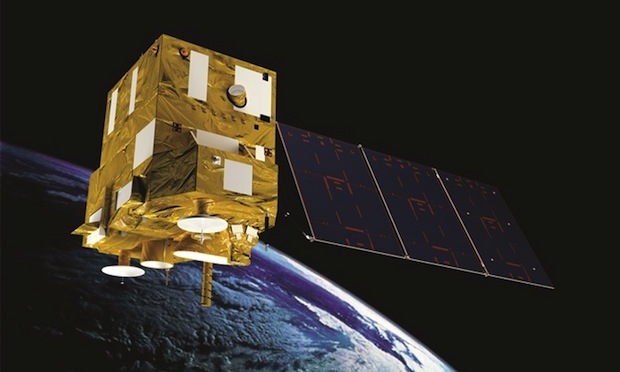 The joint satellite mission — expected to last at least three years — will track wildfires and deforestation in the Amazon rainforest, observe crop yields and trends in land use, manage water resources, and study urban development, according to INPE. Like its Landsat counterpart in the United States, the CBERS project distributes imagery for free on the Internet. INPE says it provides about 700 images per day from the CBERS data catalog to hundreds of environmental institutions around the world. China and Brazil are working on a sixth CBERS satellite for launch in 2017.